Hijacking Accounts: One way that phishers trick those on Facebook is to imitate the email template, which makes it look like you have an official message from Facebook. Once you enter login information, the phishers can take your login info, take over your account and ask friends for money or information. Viral Videos: Viral videos are huge on social media pages, especially if they are racy, shocking or scandalous. However, since they are irresistible to most of us, they are also perfect bait for scammers to use to lure their victims. When you click on one of these videos, you will be asked to update your video player, and then when you do, it downloads and installs a virus onto your system. It also shares the same scam with your friends, who believe it is safe since you shared it. To avoid this, type in the name of the video into Google, and if it doesn't have a YouTube link or a legitimate site, it is likely a scam. 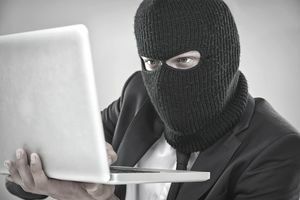 Social Media Identity Theft: Social media theft is also a common scam, and in this case, a bad guy takes your identity, posts photos of you and impersonates you online...and this can be devastating. To stop this, try to set up an account on various social media sites, including Facebook. Own your brand. And consistently Google yourself and set up Google alerts. Websites such as Knowem.com can help make it easier to grab your name across hundreds of sites. Burglary: Criminals also use social media pages, such as Facebook, to determine if a potential victim is at home or not. Publically sharing information about vacations and other times away is exactly what burglars are looking for. Just don't do it. Corporate Spying: Criminals can also use Facebook to do corporate spying. By pretending they are an employee of a corporation, setting up a group on Facebook and inviting other employees to join, criminals can spy on the company from within the company. Geo-Stalking: Using the idea of geo-stalking, a criminal can use the GPS technology of social media to stalk and find a target. Always turn your location settings off. Government Spying: Members of the government, such as law enforcement agents, are using Facebook and other social networking sites to befriend suspects of crime for information. As long as you don't commit a crime, however, you don't have to worry about it. Contest Scams: This is another common scam, and it is as simple as setting up a fake page on Facebook, marketing it with a great contest, and then watch the info come in. One such scam claimed that those who shared the link would get a $1,000 IKEA gift card, and more than 40,000 people fell for it. Basically, if it sounds too good to be true, it is. Harassment: Harassment also occurs on social media, and it goes far beyond bullying. In one case, a woman was gone on a trip, and her Facebook page was compromised. The harasser wrote several desperate status updates acting as the woman, and her friends became so worried, they called the police who eventually broke down her door.